Someone Has to Speak Up. I’ve been doing this blog for just over three weeks; it’s been challenging, I’ve learned a lot and I had no idea of the storm I would create. However, I am pleased that a debate over Biodynamics has broken out at Tom Wark’s FERMENTATION , wineberserkers, Erobertparker.com, West Coast Wine Network, and of course here. Debate, however heated, is always good. IMO, hostilities always give way to reasoned discourse. BTW, I do apologize to those who took offense; blogs must be first and foremost entertaining and fun. I sat on this blog idea for over six months because I was very concerned over a particular group of Biodynamic supporters – please don’t take too much offense with my label for you – but you’re a group that I call the “true believers.” To the charlatans and the marketers to the gullible I say you’re fair game and I’m going after you, unfortunately I can’t separate you out from the true believers. To the true believers in Rudolf Steiner, let me say it gives me no joy to debunk something in which you believe so fervently, but I believe, as strongly as you believe in Rudolf Steiner, that you are wrong and that I see this as my civic duty, my good turn, my mitzvah, to provide an alternative view of Biodynamics. Regardless of my views on Biodynamics—and it may not be much—but please be aware that I capitalize and completely spell out Biodynamics out of respect for your beliefs. I knew I’d be crucified by one element in this debate, and that has come to pass, and in some ways that’s the most entertaining for me – and if you have to ask why it’s entertaining, you’d never understand the answer. Clearly the blog has created a pressure relief valve for those who believe as I do. Some of the supporting comments humble me with the authors’ knowledge of Biodynamics and their articulate style of writing, for which I’m very grateful – I tend not to respond as much to you, because your logic is mine and/or I wish I’d said it myself. Those who disagree with me and are willing to engage in discussion are both the most challenging and the most troubling. Challenging because you push me to defend what I believe, which I love to do, and also because you bring such a foreign thought process to the table, foreign to me anyway. Troubling because the way we process information is so different from one another and that this maybe a gulf that can never be bridged. I boxed in college and alas, the bell is about to ring and I must move back into the center of the ring. LET THE NEXT ROUND BEGIN AND THE BEST THEORY WIN! This entry was posted on Tuesday, June 22nd, 2010 at 7:46 am and is filed under Uncategorized. You can follow any responses to this entry through the RSS 2.0 feed. You can leave a response, or trackback from your own site. Judging a peer reviewed article by the journal it happens to be in is unfortunately necessary regarding the above abstract. If you are a scientist and look at the overall quality of what is in AJEV you end up generally disappointed, the peer reviewers for that publication have a tendency to print fundamentally flawed articles, it is most certainly not worth a subscription. Using “brix” for example when making an assessment on fruit quality is highly suspect since that isn’t actually separating what sugars are all present. Total anthocyanin and phenols are also a very poor spurious methodology. Analysis techniques such as these do not necessarily “weight” each compound. Some phenols will react more strongly than others based on the detection method thereby obscuring a valid result. Total of anything is a very poor descriptor but them arm-chair scientist-winemakers didn’t need a *real* science degree and they certainly don’t need to understand the microbiology and biosynthetic pathways of fermentation, heh, that’s for those lab “geeks”. Total anthocyanin actually has a direct correlation on biological load of yeast and bacteria present at the time of sampling but there’s no need to address this. The powered bugs and horns fulla poo are way more likely culprits than figuring out how to get educated enough to use a microscope or actually pay to have have real science done on wine fermenation. Thanks for putting up this blog. I woulda done it but I returned to civilization. While I’m not as hard on the article as you are, I do agree with you that there are many faults with it. On the other hand, it was a first effort and hopefully future efforts will be better. I’ve written an entire post about that article that I will put up next week. I’m not being hard on the article so much as judging not only the article, but the whole of the wine industry as being scientifically negligent and I think that’s actually much kinder than most academics would state. Take for example Titratable Acidity, there is absolutely zero reason to run this method yet everyone believes that it tells you something about the acids in your wine, if you want to know about acidity you need an HPLC period. Keep in mind that this is a requirement value (TA) to produce when discussing wine chemistry in an AJEV article. Scientific rigor isn’t a convenience, it’s a requirement. Otherwise don’t bother generating the data and certainly don’t report bad data. AJEV has been consistent with publishing bad data and fundamentally flawed experiments and the article above, just by using the key words of “Total Phenols” would not meet the standards of a real peer-reviewed journal. I’m very curious to what you say about the above article! Endlich mal jemand der zur Sache geht! Biodynamics has a lot of very strange dictates – and the one I have the biggest problem with in regard to vineyards, especially old vine ones, is Steiner’s insistence on crop rotation. How can a vineyard be alfalfa one year and pasture the next??? Those farmers are some boxing experts. Copyright © 2005 by the American Society for Enology and Viticulture. 1 Department of Crop and Soil Sciences, Washington State University, Pullman, WA 99164; 2 Wholistic Estate Management, PO Box 760, Hopland, CA 95482; 3 University of California Cooperative Extension, 579 Low Gap Road, Ukiah, CA 95482; and 4 Enologix, 461 Seventh St. W., #1, Sonoma, CA 95476. Wines produced from biodynamically grown grapes have received increasing attention. Similar to organic agriculture, biodynamics eliminates synthetic chemical fertilizers and pesticides. The primary difference between the two farming systems is that biodynamics uses a series of soil and plant amendments, called preparations, said to stimulate the soil and enhance plant health and quality of produce. Whether these preparations actually augment soil or winegrape quality is unclear and controversial. A long-term, replicated, 4.9-ha study was initiated in 1996 on a commercial Merlot vineyard near Ukiah, California, to investigate the effects of these biodynamic preparations on soil and winegrape quality. The study consisted of two treatments, biodynamic and organic (the control), each replicated four times in a randomized, complete block design. All management practices were the same in all plots, except for the addition of the preparations to the biodynamic treatment. No differences were found in soil quality in the first six years. Nutrient analyses of leaf tissue, clusters per vine, yield per vine, cluster weight, and berry weight showed no differences. Although average pruning weights for both treatments in 2001 to 2003 fell within the optimal range of 0.3 to 0.6 kg/m for producing high-quality winegrapes, ratios of yield to pruning weight were significantly different (p < 0.05) and indicated that the biodynamic treatment had ideal vine balance for producing high-quality winegrapes but that the control vines were slightly overcropped. Biodynamically treated winegrapes had significantly higher (p < 0.05) Brix and notably higher (p < 0.1) total phenols and total anthocyanins in 2003. Biodynamic preparations may affect winegrape canopy and chemistry but were not shown to affect the soil parameters or tissue nutrients measured in this study. Thanks for the link and the abstract. I am familiar with the paper and it’s a good first attempt. While the results are supportive of my views, it’s still only one paper and not definitive. I plan a future post devoted to that the paper. I love this debate as much as I deplore the pseudo-philosophy (and pseudo-science) of Steiner and his fans. Well done! Pulling the curtain from Biodynamics. This blog is about biodynamic viticulture. It is not an attack on organic or sustainable farming---both of which the author supports. WHY I RESENT BIODYNAMIC FARMING! What do a Nobel Prize, a Sydney Award and The SF Chronicle have in common? 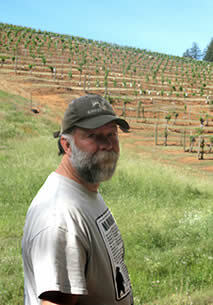 Bedell Cellars on WHY I RESENT BIODYNAMIC FARMING! alvnjms on WHY I RESENT BIODYNAMIC FARMING! Andrew M. on WHY I RESENT BIODYNAMIC FARMING! Matty on WHY I RESENT BIODYNAMIC FARMING! biodynamicshoax on WHY I RESENT BIODYNAMIC FARMING! Sheila on WHY I RESENT BIODYNAMIC FARMING! E-mail Alerts from this Blog!